On Wednesday Jan. 29, the University of Wisconsin–Stout women’s basketball team travelled to University of Wisconsin–River Falls, returning with a 66-57 victory. The Blue Devil women led nearly the entire game, behind only seconds in the first half and less than two minutes in the second half. With three minutes left in the first half, UW–Stout led River Falls 26-19, thanks to 10 points contributed by senior Sami Schoeder from Durand, and junior Brea Boomer from Grand Portage, Minn. The Blue Devils were given a run for their money when the Falcons performed a 10-0 run giving them a one point lead with 23 seconds left before halftime. In those 23 seconds UW–Stout’s freshman Becca Smith from Victoria, Minn. scored two free throws, ending the first half 28-27. Third quarter began with heated competition and strong plays from both teams. At 16:15 in the second half, the Falcons held a three-point lead at 35-32 but the score was shortly tied due to Schoeder’s free throw and a shot made by sophomore Kyleigh Hebert from Spencer, Iowa ending the third quarter at 35-35. It was a battle of free throws for the first few minutes of the fourth quarter. Hebert regained the lead with a free throw, but within seconds, Falcons player Siegle returned the favor. Junior Caitlin Combs from Alma, Wis. followed up with another free throw, but once again, Falcon players responded with a free throw within moments. Schoeder broke the free throw battle making a lay-up, resulting in 39-38 UW–Stout lead. Following Schoeder’s lay-up, UW–Stout shot eight consecutive free throws, widening the lead to 47-40. The Blue Devils held off the Falcons who at the least gap trailed five points. Throughout the game, both teams obtained a fair amount of their points at the free throw line. UW–Stout connected on 77.1 percent of free throw attempts, led by Boomer who shot 8-of-10 charity shots. UW–River Falls Falcons made 57.1 percent of their free throw attempts, contributing to the Blue Devil win. Falcons led in players fouled out with three players, and two players with four fouls. UW–Stout had one player to foul out and two with four fouls. It was a hot game for Schoeder, who led the way scoring 20 points, an even 10 in each half. She dropped in three 3-point shots the only 3-pointers made by UW–Stout throughout the game. Boomer contributed with 16 points, and the Blue Devils resulted in a 38.3 percent success rate shooting from the floor. The Blue Devils win evened the series between the schools as UW–River Falls had won in a December game hosted in the Johnson Fieldhouse. 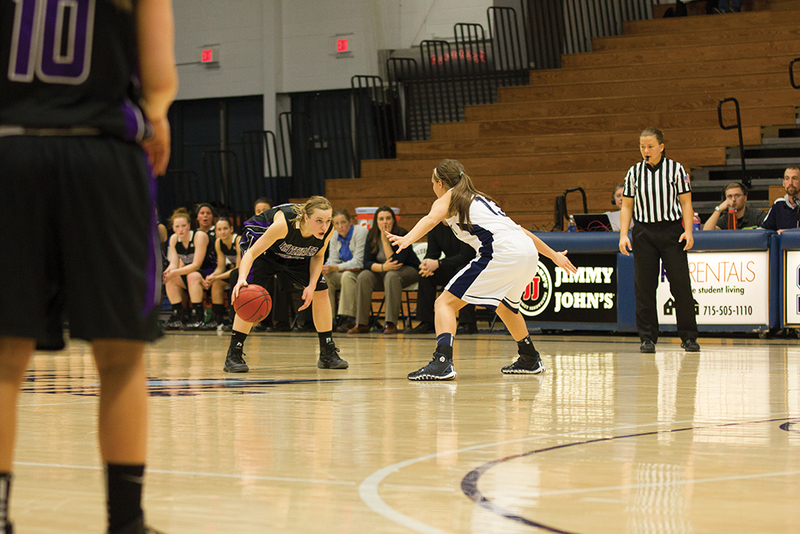 Women’s basketball will host their next home game against Hamline University on Monday Feb. 10. Come on out and show some support for the Blue Devil women!